Marti Van Liere is team leader of the GSF, responsible for strategic guidance, communication and partnerships. Marti has 30 years of international experience and a proven track record in nutrition and development, in non-for-profit and private sectors, as well as in research. 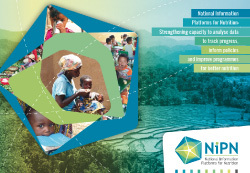 Before joining the NIPN Global Support Facility, Marti held positions at GAIN (Global Alliance for Improved Nutrition), Unilever, KIT (Dutch Royal Tropical Institute) and INSERM (French Medical Research Institute). She has a PhD in Human Nutrition from Wageningen University, The Netherlands. In 2012 and 2013, Marti served as the co-chair of the Scaling Up Nutrition (SUN) Business Network. Perrine Geniez is a nutrition policy expert, with a focus on information platforms’ policy processes and country implementation, responsible for francophone countries. She has 15 years’ experience working for the United Nations World Food Programme in nutrition and food security, either in nutrition policies and programme management or in nutrition and food security analysis and assessment. Julien Chalimbaud is an agronomist and epidemiologist, with a focus on technical issues in relation to food and nutrition security analysis. He has 15 years’ experience - mainly with ACF (Action against Hunger) - working on food security and nutrition security programme management and evaluation in low-incomes settings and in designing, implementing and analysing quantitative and qualitative field surveys. Melanie Broin is responsible for the project coordination and administrative/financial management, under the oversight of the team leader. She is also responsible for project communication activities in close coordination with the team. She has been working for the last 10 years in the management of projects on agricultural, food and environmental sciences in relation to international development, at Agropolis International. Elise Jalliet assists the team with administrative and logistical aspects of the GSF, especially concerning mission organization. For the last few years, she has been working as executive assistant supporting international projects and events with different organisations.